Virtually every single ladder accident could and should have been prevented. 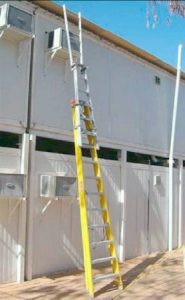 It only takes a little bit of common sense about ladder safety to prevent an accident from occurring while using ladders. Pick the right ladder for the job you are going to do. Make sure the ladder is in good condition. Set up the ladder correctly. Work safely on the ladder. Make sure all parts of the ladder are in good working order, free from corrosion, rust, rot, cracks, and other defects. Check the rungs, side rails, braces, hinges, ropes, and pulleys. See that the rungs are free of slippery substances such as oil. Never use a painted ladder because the paint can hide defects. To protect it, use a clear preservative instead of paint. Make sure that the non-slip rubber feet are in good condition. Check overall for any signs of warping or twisting. Ladders are a pretty simple type of equipment. But don’t allow that simplicity to get in the way of following safe procedures. LADDER INSPECTION IS A MUST…SO YOU DON’T END UP IN THE DUST!